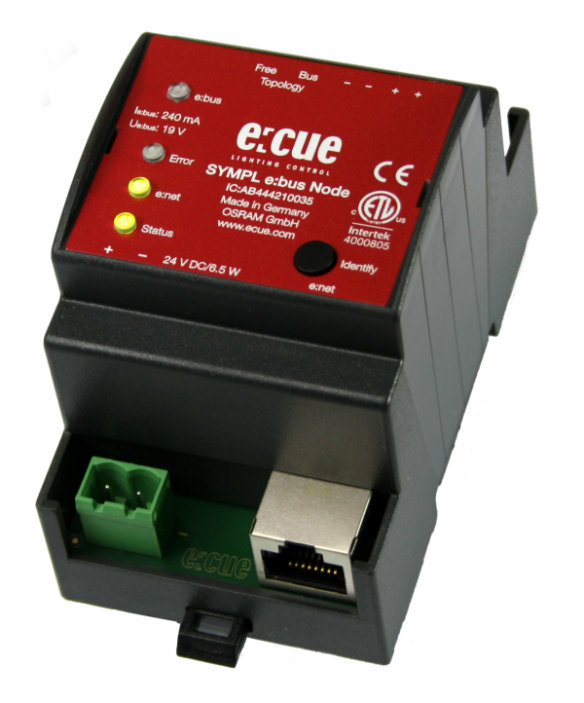 The e:cue SYMPL e:bus Node is an e:bus interface for the e:cue SYMPHOLIGHT software. It provides an e:bus interface for up to eicht e:bus participants (GlassTouch). The e:bus Node is supplied with voltage via an external adaptor or through Power-over-Ethernet (PoE). It is easily mounted onto standard 35 mm DIN rails or via a suspension hole on the back on any solid vertical surface. The SYMPL e:bus Node is a straightforward, reliable and easy to use interface solution for SYMPHOLIGHT.